VietNamNet Bridge – Da Lat is not only a renowned tourist-resort city of Vietnam but also famous for unusual and interesting sites. Linh Phuoc, located at 120 Trai Mat, Da Lat, is one of the most well-known pagodas in Vietnam with a 37-metre bell tower – the tallest in the country. The main hall consists of colorful paintings regarding the story of Buddha from his birth until he obtained Nirvana and his death. 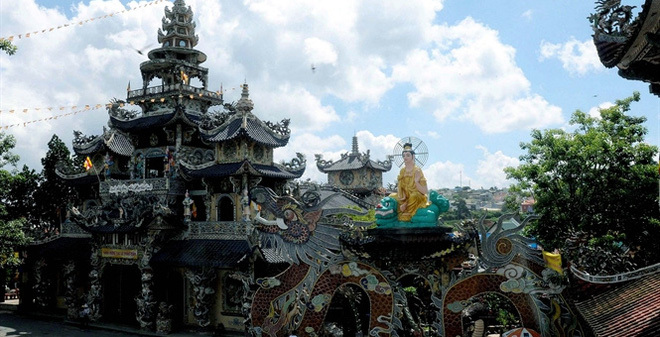 Linh Phuoc Pagoda, also called Ve Chai Pagoda, was built from debris of glass, pottery bowls and porcelain between 1949 and 1952 in a remote residential area of Da Lat City. The pagoda is led by many Buddhist monks and was renovated by Monk Thich Tam Vi in 1990. The pagoda has been managed by 4 Buddhist monks, including Mr. Thich Minh The (1951 – 1954), Mr. Thich An Hoa (1954 – 1956), Mr. Thich Quang Phat (1956 – 1959) and Mr. Thich Minh Duc (1959 – 1985). Since 1985, Mr. Thich Tam Vi has managed the pagoda including a big restoration in 1990. The remarkable feature of the pagoda is the Dragon – shaped design made from the broken pieces of glasses in accordance to the design of Khai Dinh’s Tomb in Hue. In the main temple, there is a statue of Shakyamuni Buddhist with the height of 4.9m, sitting under the root of Bodhi tree. Beside the pagoda, we can see a 49m Dragon flying around the garden. In front of the sanctum, there is Da Bao tower with 27m height. On two sides of the tower, bell and drum are put. In the tower, there are some statues of Quan The Am Bodhisattva. On the right of the tower, they arrange place for worshipping, houses for monks staying and flower garden. It has Van Thu gate and Long Hoa garden on the left, also pool, bonsai and 49m dragon. The scabs of dragon are made from 12,000 empty bottles. The head of dragon is 7m high. The pagoda has a 36- meter tower in the yard which contains a 8,500 – kilo bell in it. The bell is 4.38m high and its diameter is 2.34m. It is carved with 4 words “Linh Phuoc Tu Chung” and many statues, pagodas and patterns such as One Pillar Pagoda (Hanoi), Thien Mu pagoda (Hue), Bodh Gaya tower (India), etc. Linh Phuoc pagoda is in the Vietnam Record Book with 11 records: the pagoda with the highest bell tower in Vietnam, the pagoda made from the large volume of terra-cotta pieces, pagoda with the largest sao timber-made peacock statue, pagoda with the largest indoor concrete-made Avalokitesvara Bodhisattva statue and others. This is the only nuclear reactor in Indochina, which is located at No. 1 Nguyen Tu Luc, Da Lat city. According to the International Atomic Energy Agency (IAEA), the Da Lat nuclear reactor has small capacity (500kW) but it works safely and at high economic efficiency. 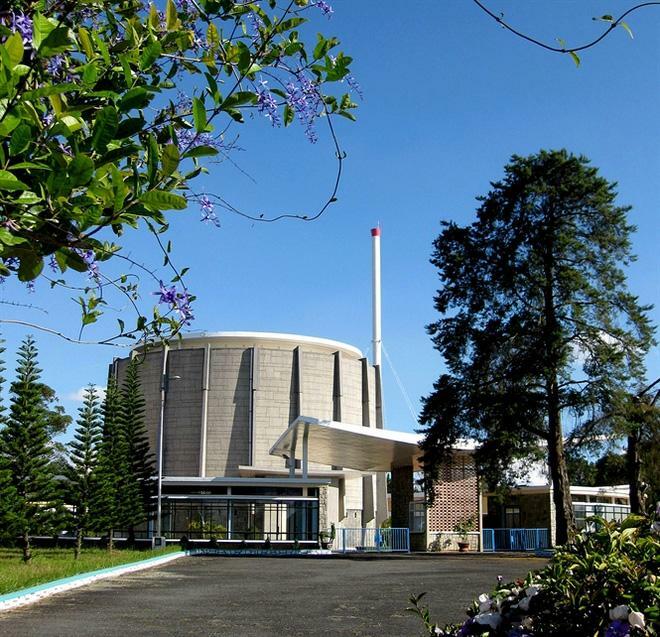 The Da Lat Nuclear Reactor, formerly known as TRIGA Mark II reactor, was built in 1963 with the authorized maximum operation power level of 250kWt, but it ceased operation from 1968 to 1975. With support from the former Soviet Union, Vietnam began to restore and expand the reactor in February 1982 and officially resumed operation on March 20, 1984, allowing a peak pulse power of 500 kWt. Da Lat is expected to build a new 15MWt reactor in the future. This is a special architectural work of Da Lat, which is located at the Lam Vien Da Lat Square. Covering an area of approximately 1,600 square meters, Hang Nga Guest House, also known as “Crazy House”, is design by Vietnamese architect Dang Viet Nga. 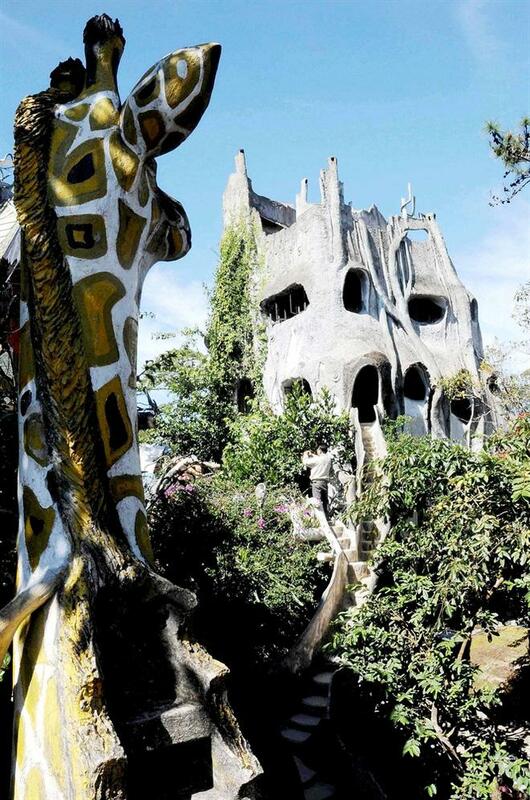 As the intention of the architect is to make a fairy tale house, the “crazy house” resembles a tree with uneven windows, and tunnel-shaped stairways. Both the exterior and the interior of the guesthouse are created and decorated with twisting organic forms and very few right angles. The hollow “tree” extends in many directions, rising above to reach the sky of the amazing Da Lat. Walking along the cave-shape hallways inside the house is not simply a visit but an exhilarating experience-a departure from the norm, wild mushrooms and spider webs popping up on your way is not unusual. The guesthouse is a spectacular construction with ten themed guest rooms such as the tiger room, the eagle room, the ant room and the kangaroo room with decorations and handcrafted furniture matching the theme. The guest house is famous among international tourists. 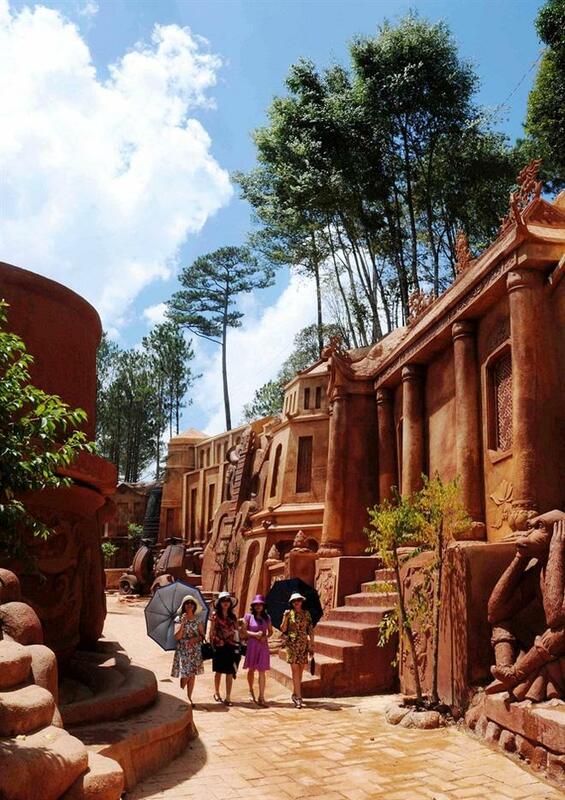 A kilometer long path snaking through a red basaltic soil hill with sculptures carved out of its sides is set to become a popular tourist attraction in Da Lat. Located near the famous Tuyen Lam Lake, the path embodies the vision of its founder Trinh Ba Dung to tell the history of the city in a uniquely creative way. Sculptures on the walls of the path purport to tell the story of Da Lat from more than 100 years ago, when the area was wild and teeming with wildlife, when it was sparsely inhabited by the Co Ho ethnic minority. Various Co Ho myths including the fleeing of the father tortoise and his children while the mother tortoise fights a huge snake are etched into the wall. The story indicates that the Co Ho were a matriarchal society. 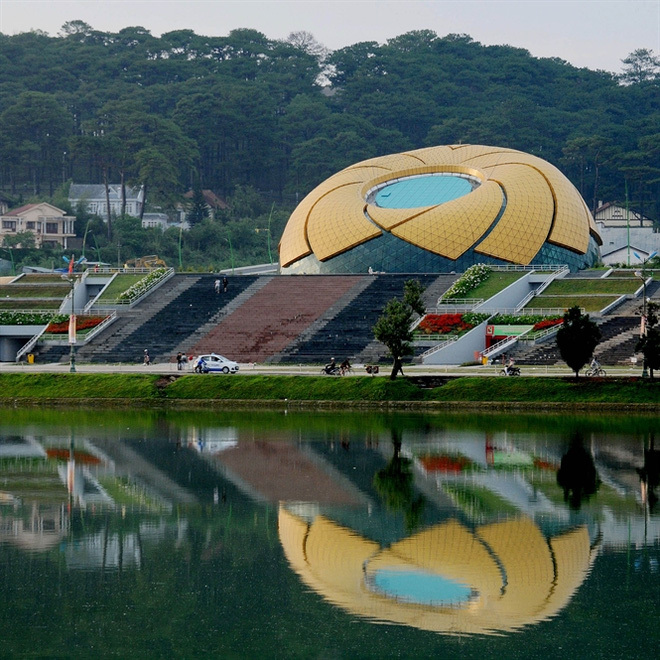 The French colonial days are indicated with sculptures of landmark buildings like the Da Lat College, Da Lat Railway Station, Pasteur Institute and old villas by the Xuan Huong Lake. The highest sculpture on the walls is 12m tall. Work on this complex began in 2010 and more than 100 artisans were on the site during its busiest times. The first work was a 90sq.m house made of soil, furnished with beds, chairs, tables, wardrobes, washing basins and chimneys, which are all made of soil. The house stands against a mountain and faces the lake. There is a map of Vietnam on its roof. The house was recognized as “The First and the Most Unique House Made of Basaltic Soil without Baking” by the Vietnam Record Book Centre in 2013. The complex won a Green Architecture Award from the Vietnam Architects Association in 2014. Da Lat is the home to Vietnam’s only one white flamboyant tree (White Jacaranda). The tree was brought to Vietnam by Dr. Ha Ngoc Mai in 1998. The tree is planted in the villa at No.75 Phu Dong Thien Vuong Street, Da Lat. Dr. Mai brought this tree to Vietnam in 1998 from Sydney, Australia. At that time, an Asian worker at a nursery in Sydney introduced Mai to a violet flamboyant grafted with a mutated white flamboyant tree. The price for this violet-white tree was $25. Three years later, the tree began blossoming bunches of white flowers. The first bunches of white flamboyant yielded several fruits and Dr. Mai cultivated over 50 seedlings from these fruits. However, they produced violet flowers, not white. This is one of the most unique hostels in Vietnam today. 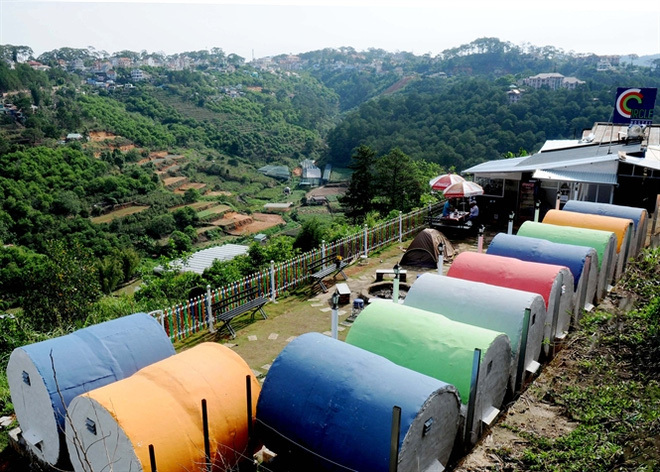 The Circle Hostel is a hotel in Da Lat that provides guests with the option to spend the night in a tube. For only VND200,000 ($9) per person, you can have one of ten pipe-shaped ‘rooms’ and one of the more unique accommodation experiences in Vietnam. The Circle Hostel is built with a unique style using the round tubular construction of the room and decorated with different colors. The hotel is located between a pine forest, and you can look down the valley and hill. The hotel has 10 round tubular colorful and unique rooms. The rental is reasonable, $10/night/one person, $12.5/night for 2 persons, $15/night for three persons. In addition to the unique shape, the rooms are decorated with different colors, and are cheerful, youthful, with lively layout. Due to the special design, tube-shaped rooms have not much space to put the toilet inside so there is a separate toilet and bathroom outside, which is very close to the rooms. With the advantage of a beautiful location, situated on a small hill, quite wide and beautiful views from their rooms, visitors can see the pine forest, residential or garden terraces, garden fruit of households … On the high hill in early morning and evening you can see smog covering the whole valley below. At night is the best time to have a campfire, gather with friends or relatives, while watching the city lights up. You can also enjoy coffee, artichokes, free tea, books and sightseeing or bonfire, BBQ with friends …. 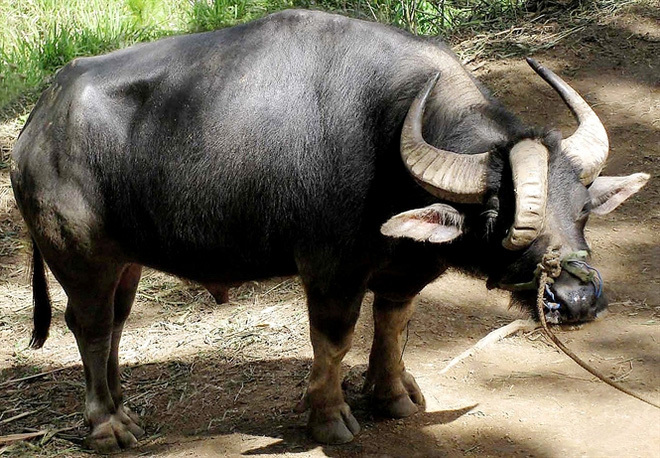 Mong Mo Hill in the resort city of Da Lat, Lam Dong province, is the home to the strangest animals in Vietnam, such as five-horn buffalo, five-leg pig, four-wing duck, etc. These animals are collected throughout the country.